Improving turbine engine performance is an objective constantly being pursued by designers in the aerospace industry. 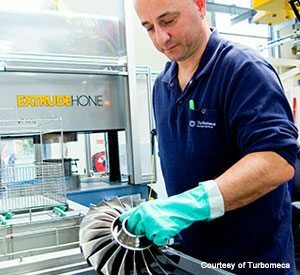 Performance, reliability, fuel efficiency, and component longevity are all important aspects of turbine engine development. Our Extrude Hone® processes are leading the way to achieving high-quality results and highly efficient production methods. In addition to achieving better product and production results, our innovative solutions can also help you achieve higher sustainability standards by lowering emissions through improved fuel efficiency. Improve air flow on turbine nozzles, impellers, and blisks. Deliver air foil, flow path and root fillet roughness improvement in a single operation. Avoid cracks by removing stress risers on disk edges, no matter the profile. Maintain the highest quality under demanding specifications. Reduce fuel consumption and emissions while optimizing engine performance by flow-tuning injection nozzle components. 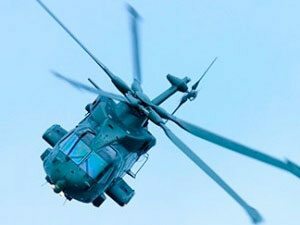 Our Extrude Hone AFM (Abrasive Flow Machining) process is a natural partner for the finishing of aerospace components due to AFM’s ability to fit the geometry of these components perfectly, providing the opportunity to polish in the same direction as the flow. This can help your turbine engine deliver more power while improving component integrity. 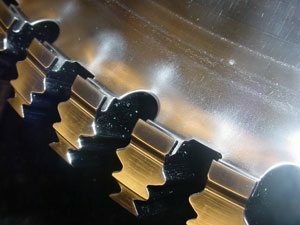 The freedom of component design, the thickness of the blades, and the nature of the alloy are not challenges, as Extrude Hone will design the tooling and the media to fit the application. Our AFM process is ideal for applications including impellers, diffusers, blisks and guide vane segments. The Extrude Hone AFM process can create a true radius and/or a rounded edge for complex shapes and openings such as slot and hook profiles and hole extremities. This reduces stress-related crack development, especially the risk of cracks generated during the shot peening process. Combining edge preparation with the Extrude Hone AFM process is an effective operation that can be fully automated. Whatever your slot design (including fir tree or bulb with or without hooks), the Extrude Hone AFM process can match your requirements, with the ability to accommodate a single radius geometry or a combination of various radii. Our AFM process also aids in the removal of manufacturing anomalies generated during cutting as well as plucking defects or smeared material deposited during machining operations for slot surfaces with fir tree or bulb radiusing.